The Apple iPad Plus, the large 12.9-inch tablet allegedly being worked on by Apple, has been delayed according to a report published on Wednesday. The delay is said to be caused by Apple's inability to obtain enough screens to produce the tablet. Today's report says that the large-screened slate won't go into production until September. 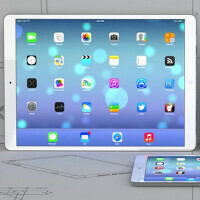 Original plans called for Apple to start mass producing the tablet this month. The source of this information is said to be an anonymous tipster who is familiar with Apple's plans. Last month, alleged specs of the iPad Plus leaked. The tablet is expected to feature a 12.9-inch display with 2K resolution. The tablet is believed to be 7mm thin and weigh in at 700 grams. An 11,000 mAh battery is rumored to be inside. Apple is holding an event on March 9th at which time the tech titan is expected to reveal the latest information about the Apple Watch, including a launch date. Prior to today's report, there had been some hope that Apple might use the event to pass along some information about the large-screen slate. But if this report is legit, Apple might wait before making this product official. This thing will be ungodly expensive. I'm thinking $600-$650 starting price for a base model. It better not be. In fact, I'd be pretty surprised if this was above 600. Anything above that better come with a full OS. I would honestly never expect a full OS for iPads as long as MBPs continue to sell well. Doing so would eat into their sales. Agreed, but pricing this at or around $700 US? That's 100 away from the surface pro 3, which offers a full desktop OS. Maybe it's just me, but the idea of buying a $700 tablet with the limitations of a mobile OS sounds crazy to me. I bought my iPad Air 2 for 500 and I thought that was pushing it. But it is one incredible device. it could cost more than 600 it will mostly likely come with a better soc it has huge screen (more laptop like than tablet) and who's to say that it want come with a full os. apple is bound to make an ipad with full os sooner or later. "what did you, or do you expect? " this is Apple, not Android, cheap knockouts. Apple has great resell values. iPads are very well made, by aluminium metal and zinc. Not made with crappy plastic. We asked Apple, yet again they gave us what we want. We praise, love and admire Apple. 600 USD for sure, what's up. I feel like more than that though! LOL must like the iphone plus every year till they finally released it. With that money it would be better to buy something actually useful like the Surface Pro 3 (or 4). It would be cool if it had both OS, iOS and OSX, the latter with attached keyboard. 700 is too expensive for tablet. I bought new and latest 13inch macbok air for 750 last year.